Setup a copernicus network ready to run projects and distribute tasks for you. Create a project workflow for molecular simulations. Learn how to monitor project progress, fetch results and alter input data while a project is running. The section getting-started of the User guide covers the installation of Copernicus. In projects where one runs many variations of a simulation many small things add up and the process can become tedious. Imagine having to manually copy over all files to various machines, run the simulations and download them to another machine for postprocessing. When work adds up the possibility for errors in simulations or machine errors also increases. In this example we will build a molecular simulation workflow that lets us handle multiple simulations. By providing a couple of input files we want this workflow to generate molecular simulation jobs. Copernicus will then automatically distribute these jobs to available worker units and monitor them. In cases things jobs go wrong they will be automatically regenerated and put back on the Copernicus queue. In some cases things go wrong and requires user intervention. Copernicus will in these cases halt that job and ask for a user to interact. All of this allows the user to focus on the problem instead of having to focus on what things should run where. Workflow components are called functions. Functions operate on inputs and generate outputs. Outputs of one function can be connected to the input of another functions. Copernicus already has many ready made functions for Gromacs. We will utilize these to create our workflow. Before we create a workflow we need to start a new project. You can now see the newly created project in the projects list. inputs is Neach input will go to its own instance of grompp. Among the functions you will see two called grompps and mdruns. These two functions can handle multiple simulations. lets start by creating one instance of grompps. we see that the our grompp and mdrun blocks are there an there status is “held”, This means that they are currently inactivated and not running anything. When we have finished building the workflow we will activate them. We have now created an instance to each function, however they are not connected yet. We will now connect the two block so it looks like this. The look of the workflow after we have connected our blocks. 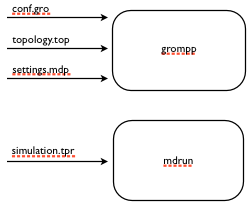 The output of grompp is tpr files, and we’d like grompp to pass these on to mdrun once it’s produced. First we call the command cpcc transact. This way we can send many commands at once and treat them as if they are a single update. When we are finished sending commands, we’ll finish the transaction block with the command cpcc commit. Once the transaction has started, we connect the blocks. We do this by connecting the grompp tpr output to the mdrun tpr input. here you will notice syntax like grompp.out.tpr, These are called workflow paths. The next section we’ll cover them in more detail. We can now activate all the workflow blocks. This means that they should start listening to incoming input. This tells Copernicus that it should start processing all the commands that we have called during this transaction. At this stage we have finished building our workflow, and it’s ready to take input. Earlier when we used this command the functions where in a held state. This time we see that they are active meaning that they will react if we provide input. We can also take a deeper look at an individual function to see what inputs and outputs it handles. This is done by calling cpcc ls followed by the name of the function. To inspect or set the actual values, we can use the cpcc set and cpcc get commands. We will use these soon to provide input files to our projects and later take a look at the results. To get things to run, we need to provide 3 input files: a configuration file, a topology file which describes the system that we want to simulate, and an mdp file which contain the simulation settings . These files are standard Gromacs file types, and for this tutorial you can find them ready made in the tutorials directory. we will use the cpcc setf command to provide the input files for our grompp function. The section grompp:in.conf[+] specifies where a file should be sent to. in this case we want to send it to the conf input. the last section [+] means “add this file”. Remember when we did cpcc ls grompp:in and we saw that the conf input was an array? that is why we can add files by using the plus. lets add the topology file and the mdp file. Our grompp block has now gotten enough information to generate an output, and send it to the mdrun block, The mdrun block will then send a simulation job to the work queue. By now the workflow should have gotten the input it needs to prepare a simulation. If we take a look at the queue we should see that an item should have appeared. This means server has generated a job and waiting for a worker to send it to. If the worker is still running it should receive this job within maximum 30 seconds. For the sake of this tutorial the simulation is very short and should be finished within a minute. In reality a simulation could take days. The worker would in these cases send back intermediate results to the server in one hour intervals. which would download the trajectory to our home directory. Again we see the square bracket syntax, this time with a digit instead of a plus sign. As we noted earlier some inputs and outputs are array types. In the case of the output this means that we can have multiple outputs. We specify which output we want to look at by specifying an index number. Projects usually run until you decide its finished you can always pause them temporarily by calling. At one time you might want to finish a project and move it away from the server. The command cpcc save will save your project and backup everything in a compressed file. cpcc save will also deactivate your project however it will not delete the project from the server. You will need to do that yourself. The project is restored but held in a deactivated state. you can start it with cpcc activate.